The end of October – (how can it be?) – so here is the tenth Canvas Print. 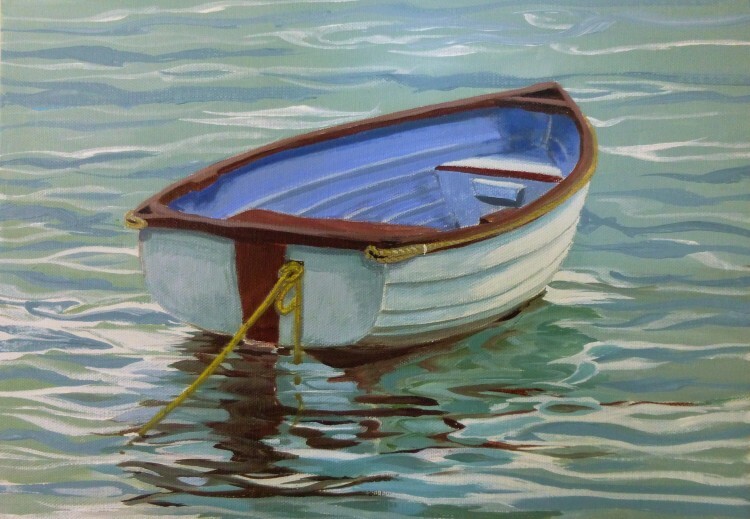 This one is a dinghy from St Ives in Cornwall which I found when I was on holiday down there in September last year. The original painting sold at the Haylett’s Gallery in Maldon this summer, and, of the limited edition of 6 canvas prints, one has already sold! – so there are just five available. All the details are on the Canvas Prints page – £25 including postage to any UK mainland address. 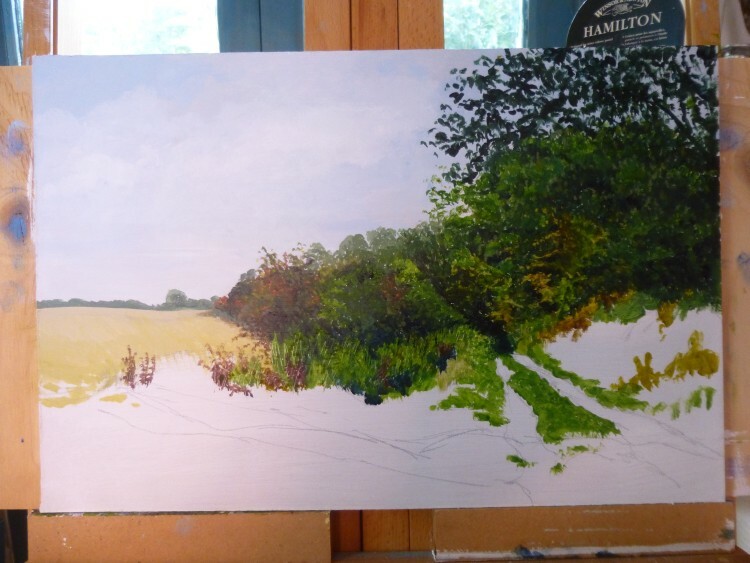 In the studio this morning making a start on the second of the Peddars Way paintings – this one will be called ‘Procession Lane’. 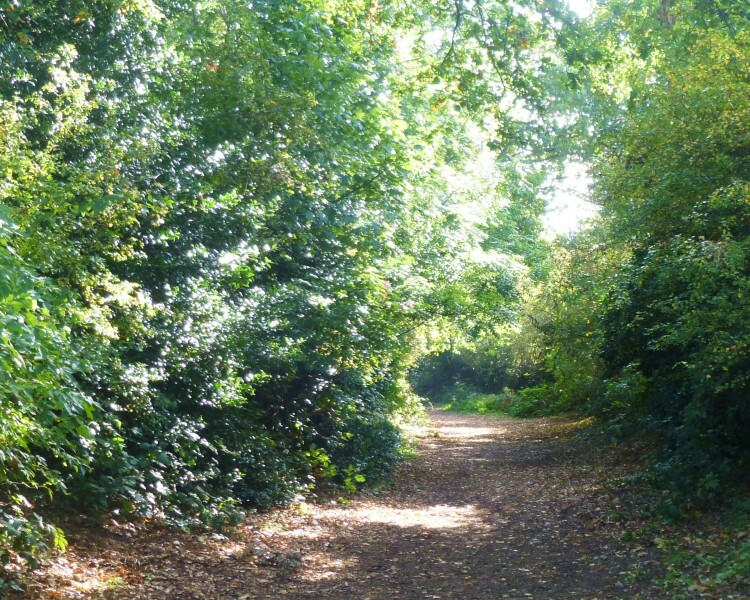 It is looking northwards on the section of the path that runs between North Pickenham and the crossing of the A47. Unlikely as it seems today, this grassy green lane was once a Roman Road! So here’s the first of the Peddars Way paintings all finished. 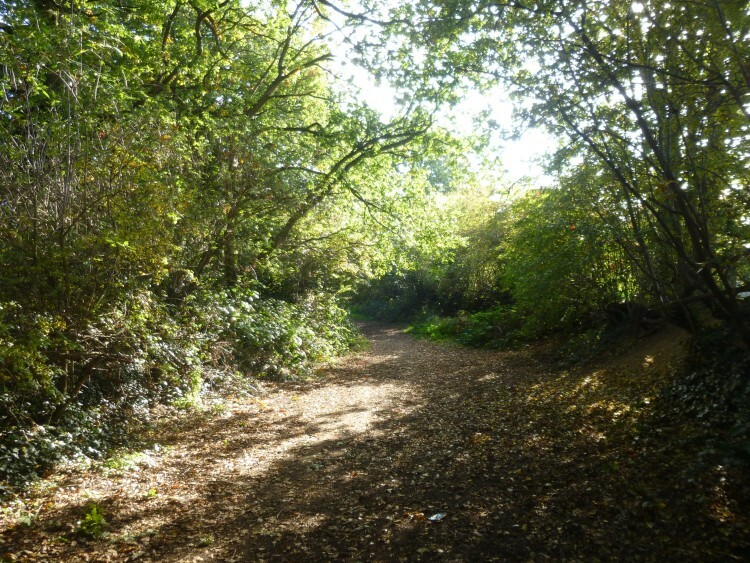 This is just north of the village of North Pickenham, and is where my sister and I started the first of our Peddars Way walks. We are hoping to do a third section, nearer to the coast than we have so far walked, some time in November – if the weather is good! All the details on the Gallery 2015 page as usual. My last painting of this area was so popular (although I don’t want to sell it!) that I was looking for good spots to paint another part of this path. 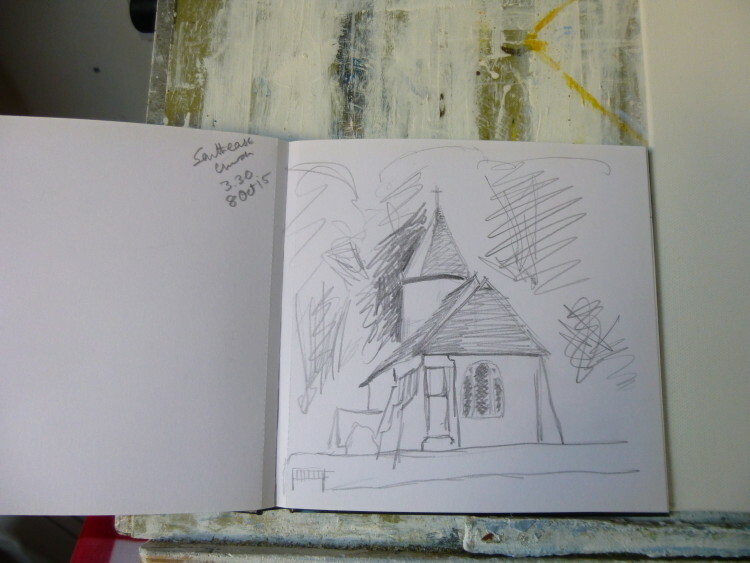 I set off with sketchbook, my little silver ‘drawing’ tin and my camera. The trees had not ‘turned’ as much as I expected, but I still like the over-arching tunnel like effect, and the way the light comes through in bright patches on the path. The last three questions that several different people asked me. Here goes with some answers! Yes, I do use painting knives of various kinds, mostly when I am painting sea, or massed foliage, or long grass. I’ve got a number of different shaped knives that are good for different things. 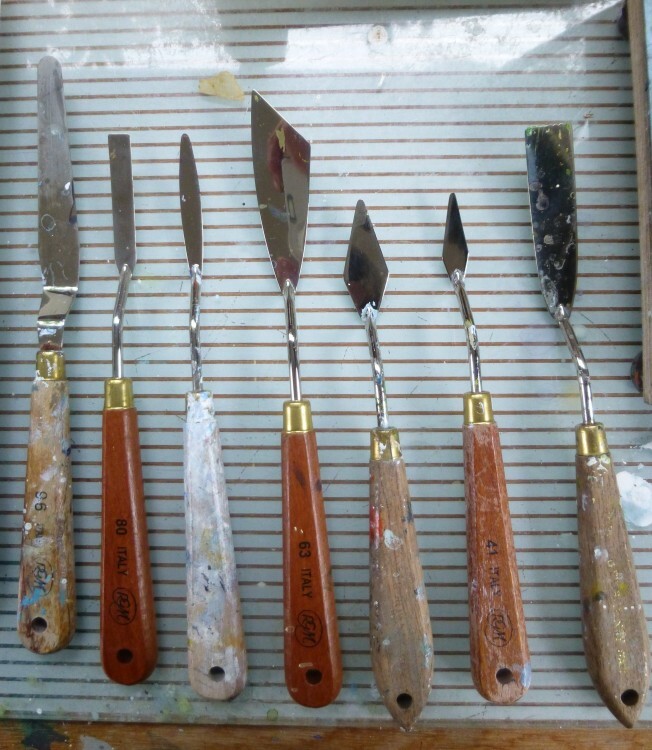 You can’t really see in the photo, but the knife on the extreme right has a serrated edge which is rather useful for scraping a narrow parallel line pattern into paint – have a look at the field in ‘Suffolk Lane in May’ (Gallery 2014) which is a good example of the effect. The ones I use most are the two diamond shaped ones. 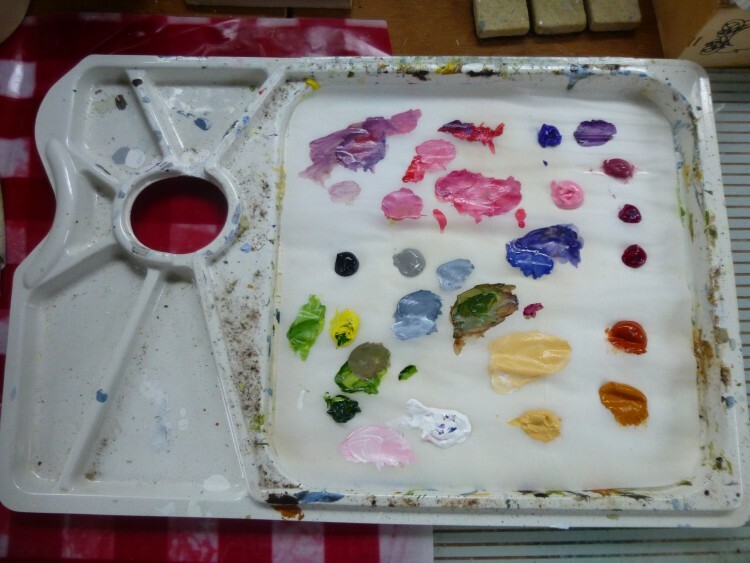 The knife on the far left is for mixing paint on the palette – I always use a stay wet palette, as it really makes the paint last and stops you wasting so much at the end of each painting session. Provided you keep the absorbent paper damp, in the base of the palette, paint will last for about a week without hardening or drying out. As you can see, I do have a few quirky brushes for specific jobs! The two sword shaped brushes on the far left are great for painting water, and the fan shaped brush is very helpful for grass and foliage. I have a larger sized one of these as well. 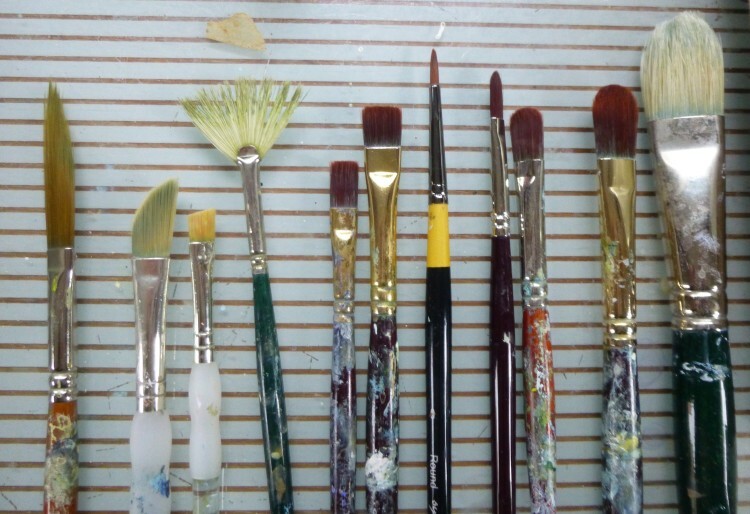 This photo just shows a selection of brushes – I have a lot more, but most of the others are in various states of decrepitude! ‘Is this oil or acrylic? Lots of people asked these questions. Here are the answers. I never use oils, all my paintings are acrylics. I use them completely undiluted and mixed straight out of the tube onto a Windsor & Newton ‘stay wet’ palette with a palette knife. I think because the paint is thick and brush marks can be seen, they can easily be mistaken for oils, though, so I’m never surprised when people ask. 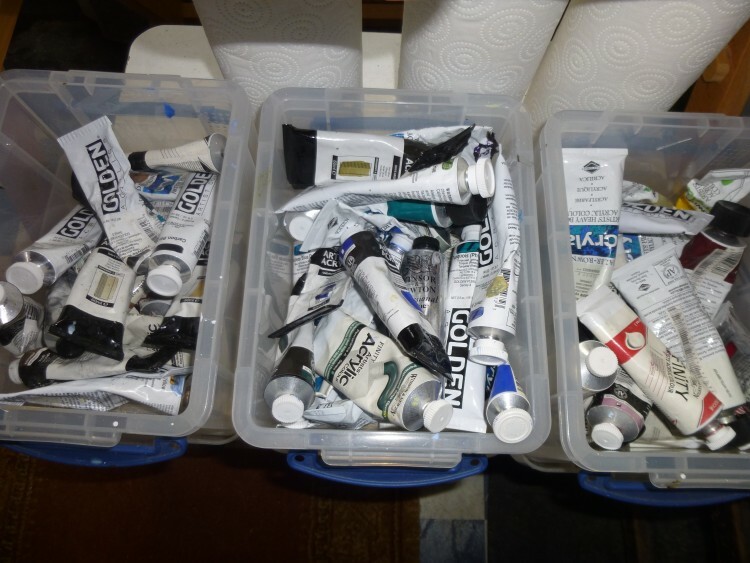 I mostly use Windsor & Newton Acrylics, and Golden Acrylics, but also have a few Daler Rowney ‘Cryla’ heavy body acrylics – I think these are quite old tubes, and I’m not sure if this is still available. I have them sorted into three plastic boxes, one for neutrals – the greys, umbers, siennas, whites, browns; one for all the blues and greens; one for the reds, oranges and yellows, including some odd colours like ‘potter’s pink’! The three boxes sit on a little table that fits underneath my easel. I have to admit I have far too much paint! Usually I only use six or seven colours plus titanium white for any painting, but I can never resist buying a new interesting colour! I also use Daler Rowney FW Acrylic Ink, in a few neutral colours. White is particularly useful as it is a very intense white, but is, of course, much more liquid than the paint, so it can solve specific problems of applying a bright white accurately to a small area. I use the white acrylic ink a lot in the dinghy paintings. Recently I’ve also started using Sennelier Oil Pastels, mostly for landscapes, but also in some of the ‘From my Garden’ series. 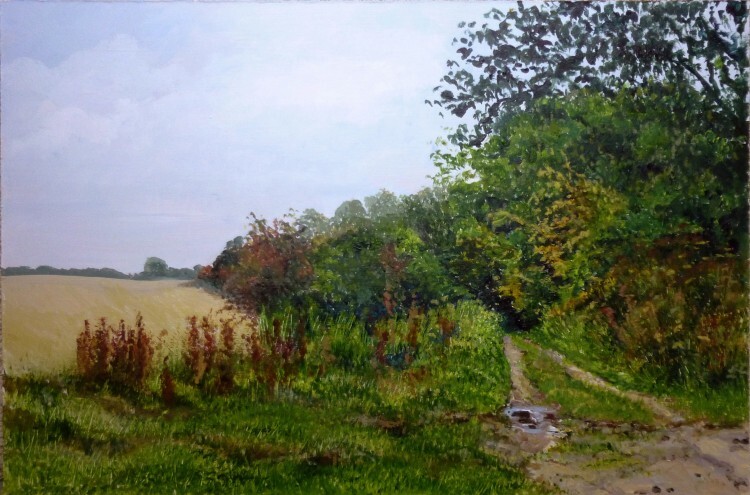 They are useful for adding flecks of clear colour over an acrylic background; I used them in the trees of ‘Essex Field Path II’ and on the buttercup fields in ‘Cymbeline Meadow’ and ‘Summer Afternoon on the Colne’, for example. 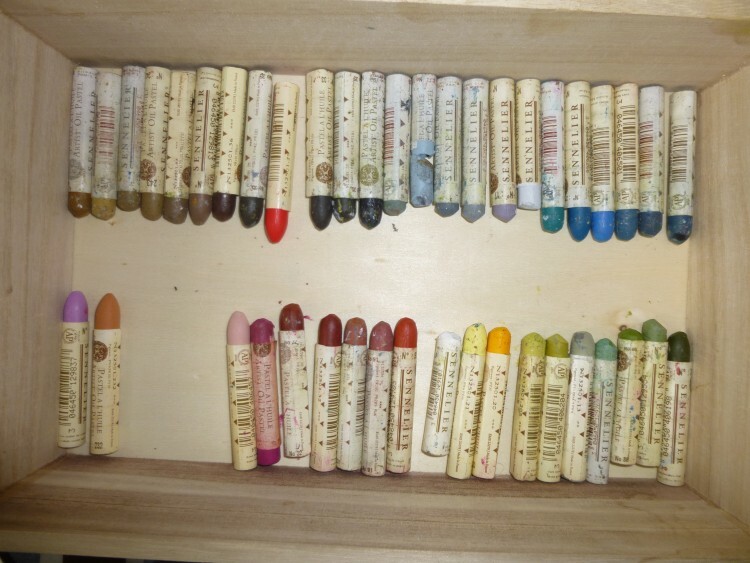 I keep them in a little box on a stool beside the easel, loosely sorted into colours – although what that bright red is doing where it is I have no idea! I use an assortment of different boards to paint onto. Mostly it will be Windsor & Newton Canvas Board, which comes in a good range of sizes. It comes primed, but I always give it one more coat of Acrylic Gesso Primer, as it gives the surface a bit more ‘tooth’ which I like. I also use hardboard, and sheets of thin (3mm) mdf, both of these mostly for larger paintings, or unusual sizes. The mdf needs two coats of primer, but I find the hardboard generally needs three to get a good surface. Next I’ll be answering questions I was asked about brushes and other tools. The tenth in this series, From my October Garden is now on the Gallery page. A little shot of colour on what is a dark and drizzly Friday morning at the Anvil House! During my Open Studios weekend at the end of September, I was struck by how many people asked the same questions. So I thought I’d do a few posts answering some of the most frequent queries. 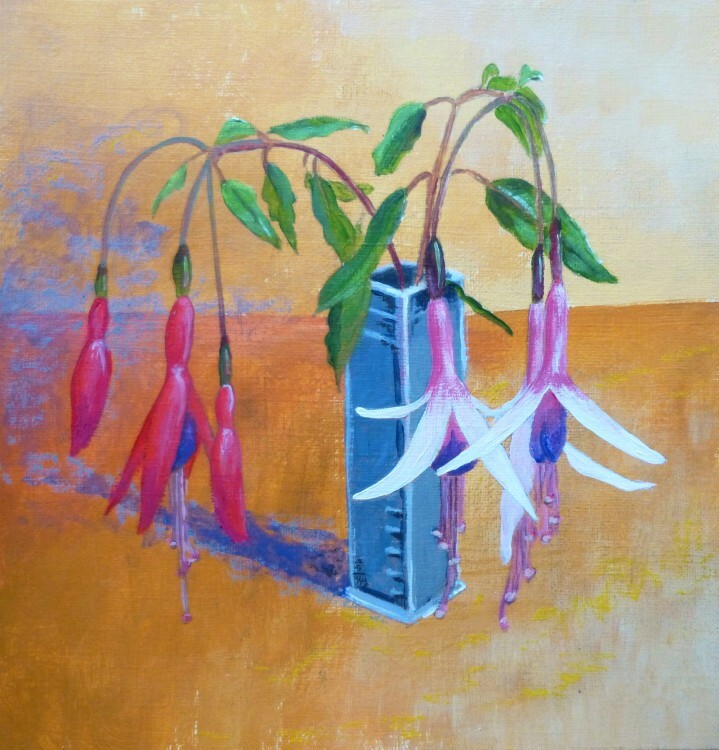 A few years ago, I was told by a ‘knowledgeable person’ that I must always paint on the spot. 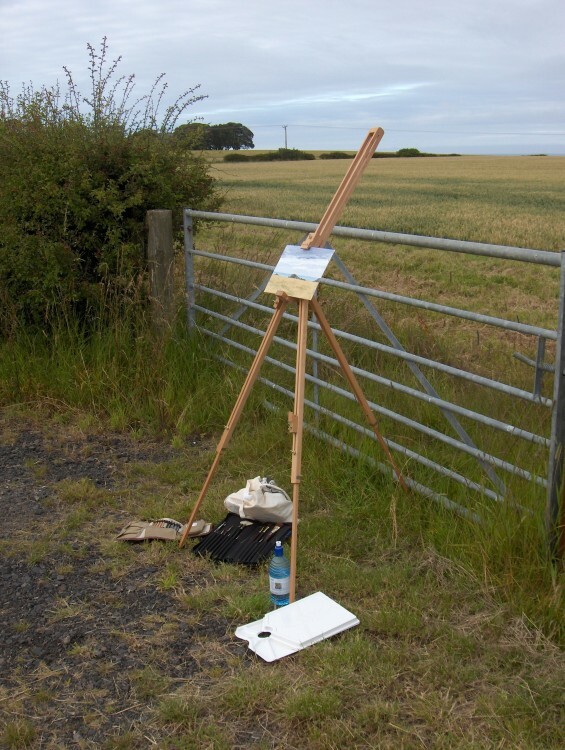 So I bought a lightweight Field Easel and had a go. I was just about to have a holiday on the Northumberland coast, so I thought that would be a great time to start. My very first ‘plein air’ painting was of the Farne Islands from the sand dunes just south of Bamburgh Castle. It wasn’t that far from where I had parked the car. Fortunately. . . . . I carried my easel, and a couple of canvas boards, and my brushes in a brush wallet to protect them, and a bottle of water, and a container to put the water in, and my stay-wet palette, and a bag with all the tubes of paint that I thought I might need, and some kitchen roll for wiping the brushes. The first problem was getting the easel to remain steady. The sand was very soft, and it was very windy. 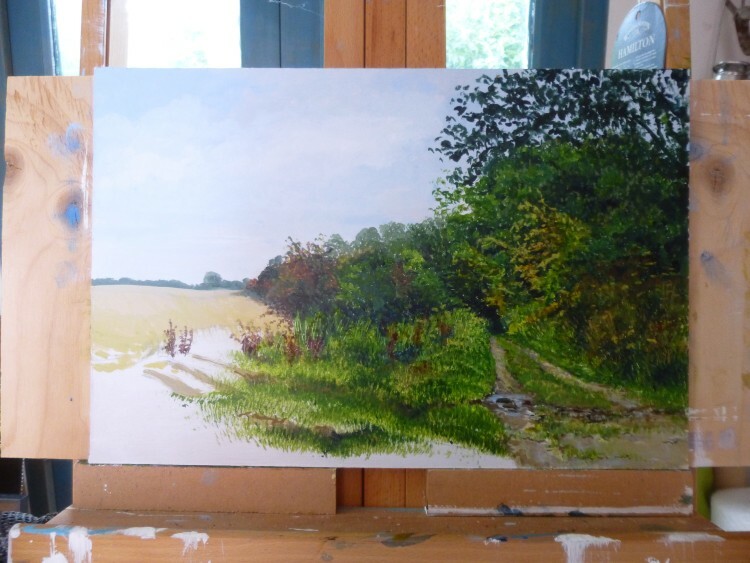 The second problem was that the paint kept drying up on the palette – even though I was using the ‘stay-wet’ palette – because the sun was hot – and it was very windy (see above). The third problem was that the paint didn’t dry quickly enough on the canvas. 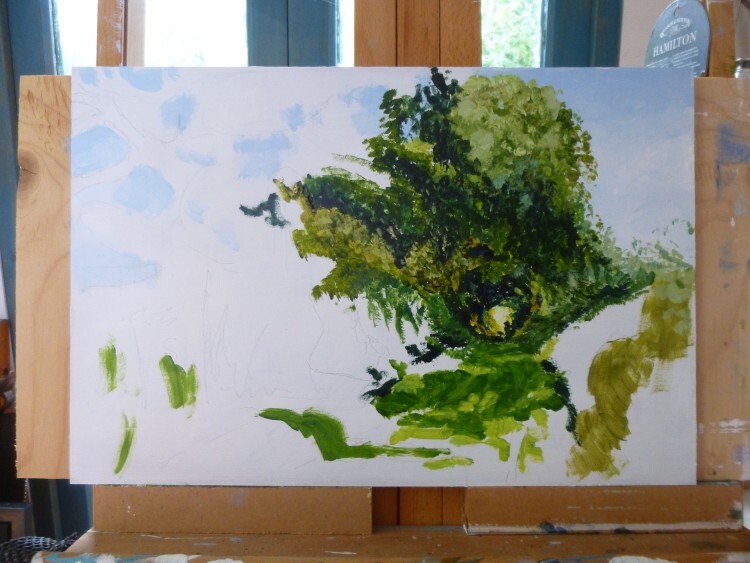 Usually I build up the painting in a series of layers, letting each one dry completely before I work on top of it, but that wasn’t possible, and I soon seemed to be wading about with my brushes and palette knife in a sticky mess. 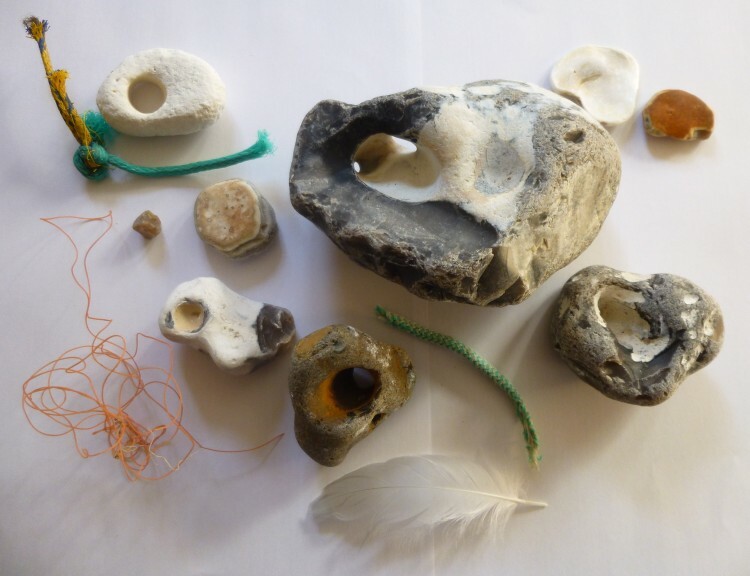 And then the tide was going out fast, so the shapes and extent of the rocks kept changing, and the light constantly shifted as the clouds raced overhead. 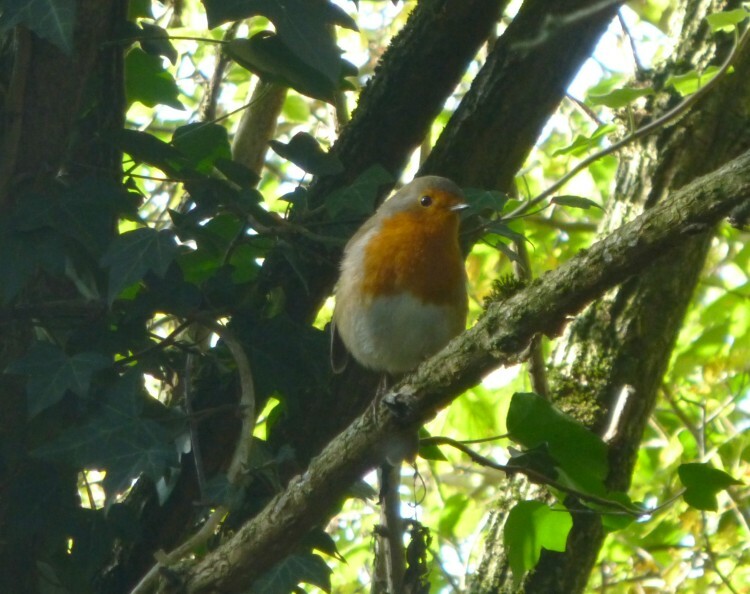 It wasn’t a very happy experience – but undeterred I thought I’d try again. This time it was at St Abb’s, further up the coast, over the border in Scotland. The little harbour jutted out into the wild sea, and there was a rugged coastline with various small islands. 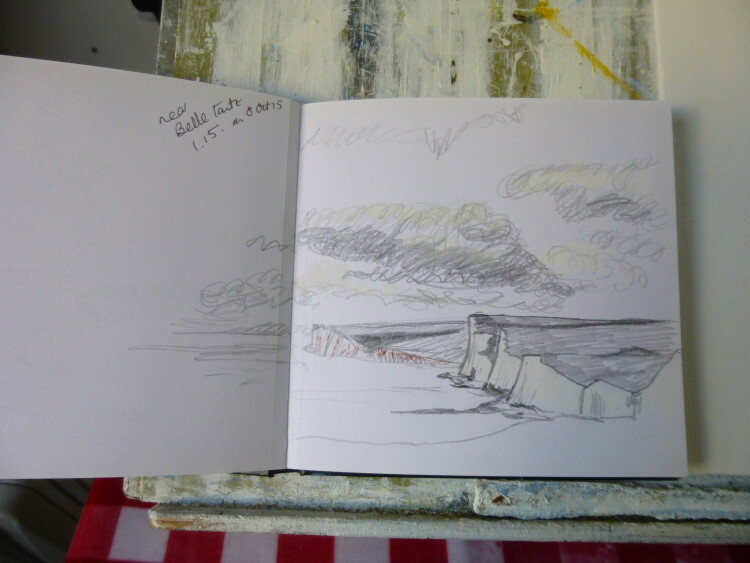 I set up my easel on the end of the harbour – much easier this time as it was on flat concrete. 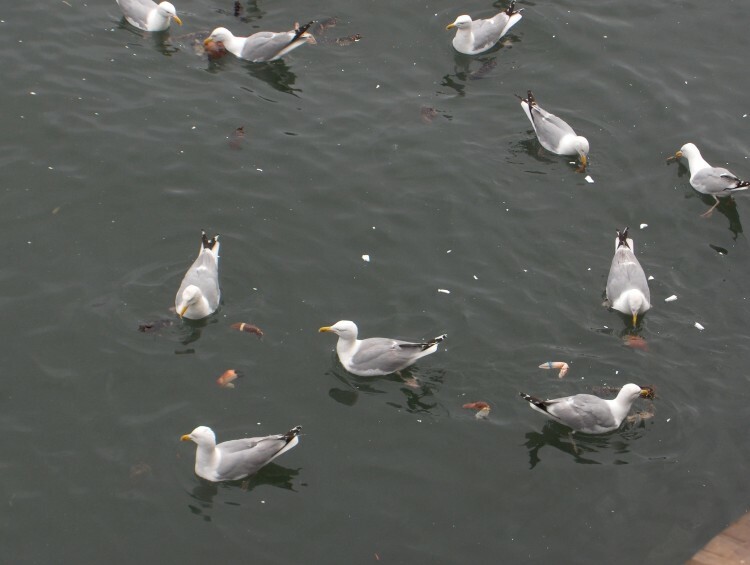 I was getting on a bit better when a fishing boat came into dock almost next to me, and a large refrigeration lorry backed up behind me, and I became surrounded by a flock of vociferous gulls, as the fishermen threw all sorts of odds and ends into the sea. The noise was deafening, but I tried to carry on, getting less and less pleased with the result. And when I packed up, there was the problem of transporting the very wet and sticky painting back to the car. I know you can get box easels for outdoor work that have a built in canvas holder, but even the ‘light’ ones are so heavy to carry. I had one more go, the following day, a field sloping down to the sea, overlooking Lindisfarne. It was on the farm where I was staying, so not very far to carry everything. Again, I wasn’t very pleased with the results – it just seemed an awful lot of effort for a very bad painting! I don’t paint on the spot. I don’t like carrying all the stuff, I don’t like contending with the elements. But most importantly, I don’t like the way that I am forced to paint when I’m outside in front of a quickly changing scene, getting everything down over the whole canvas fast. And I don’t like the fact that there is no time to mull over what you’ve done so far, and see what the painting needs next, as a painting, to make it work. So this is what I do instead. I draw on the spot and take photographs too. 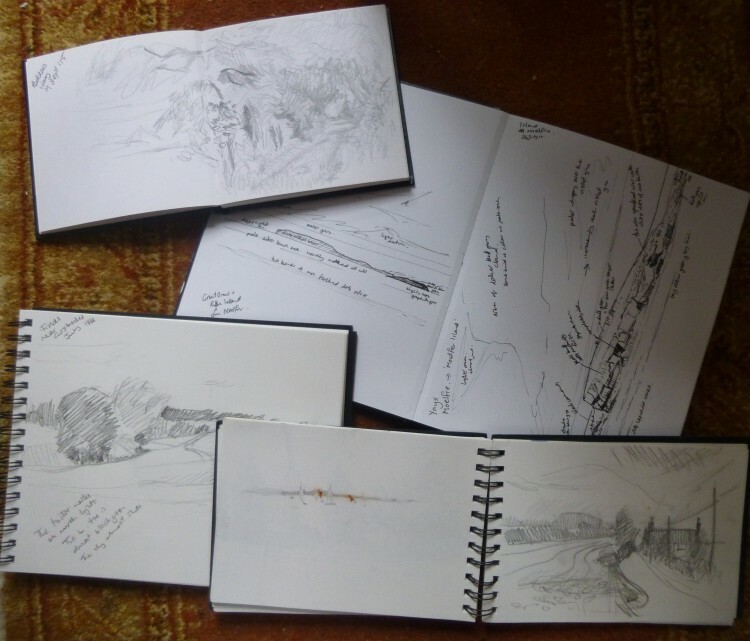 I have a range of sketchbooks, different sizes, some spiral bound to open flat, all hard back to make it easy to press on them. I take a little tin box which contains pencils in various grades, up to a thick 9B graphite stick, and some fine-liner pens and a pencil sharpener. In my drawing I try to think about where the edges of the painting will be, what will make a strong composition, and I write notes for myself about the colours – sometimes even the paint-mix that I think will work. Then I take photographs, trying to match up the view in the camera with what I’ve drawn. And this always highlights the fact that we do not see like a camera. What we focus on, what interests us, we see as proportionately bigger than other areas of the ‘picture’. 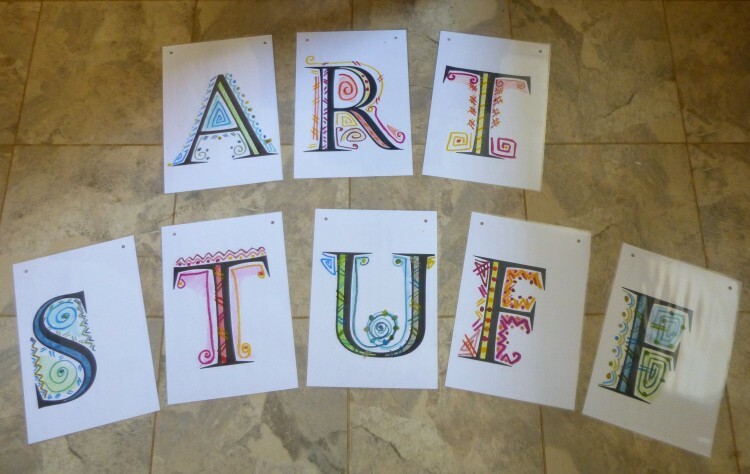 When I’m painting I go by what I’ve drawn, and just use the photographs, which I print out onto ordinary cheap A4 paper, for details and colours which I want to check on. So, I hope that wraps up that question. 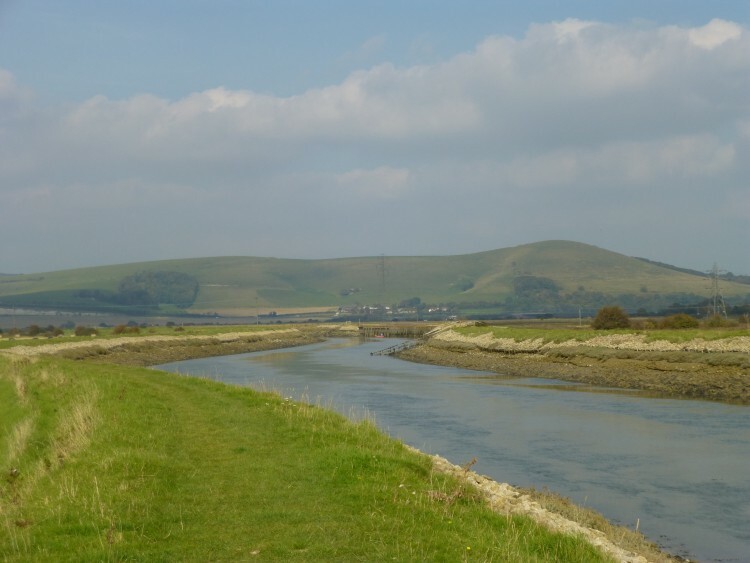 My last day – and I went to the Cuckmere Valley. The weather was beautiful, really warm and sunny. First I drove up the charmingly named ‘High and Over Hill’, from where there are spectacular views over the river valley with the looping meanders of the river sweeping across the valley floor. 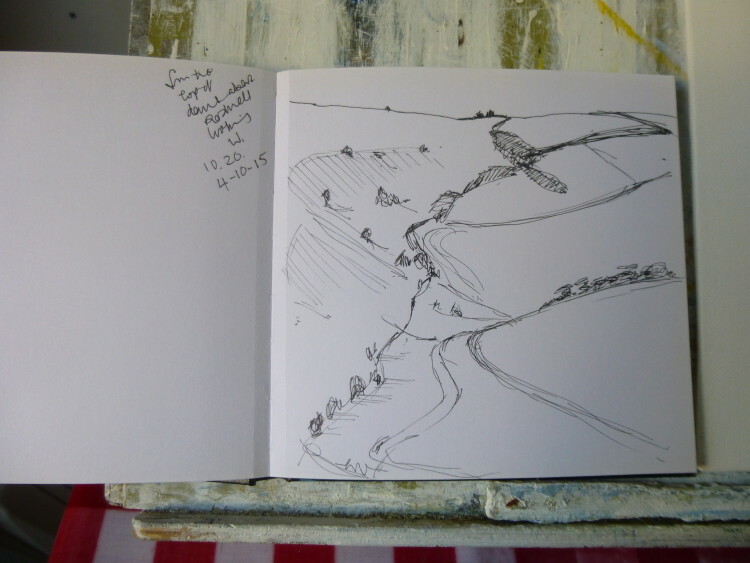 I sat on a convenient bench to draw the downs on the other side of the river valley. Then it was off down to the visitors centre in the valley – a quick lunch, and another walk along beside the river meanders towards the sea. The river was as still as a mill pond, and the cloud reflections were beautiful. 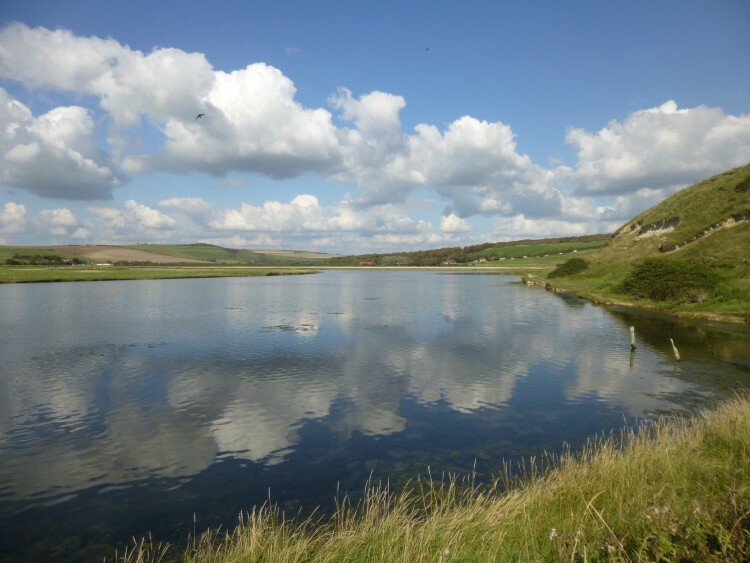 While I was driving and walking around the South Downs during the week, I was struck over and over again by the ‘Eric Ravilious’ style views I kept seeing – and his painting of Cuckmere Haven is a particularly lovely one. Earlier in the week I had been to the Towner gallery in Eastbourne to see their exhibition of work by Ravilious, supplemented at present with works on loan from Aberdeen. 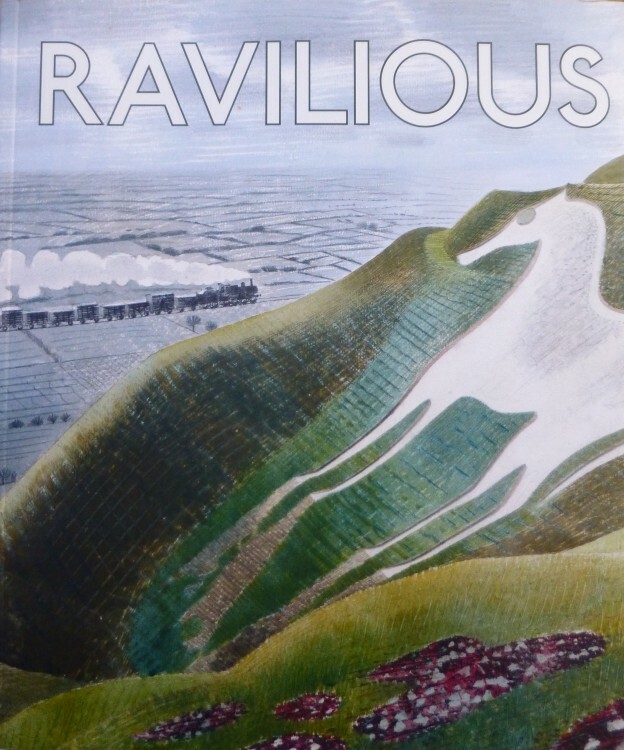 I was particularly pleased to see ‘Train Landscape’ in reality, and to pick up two lovely art books which I know I am going to enjoy reading and looking at, James Russell’s ‘Ravilious’. 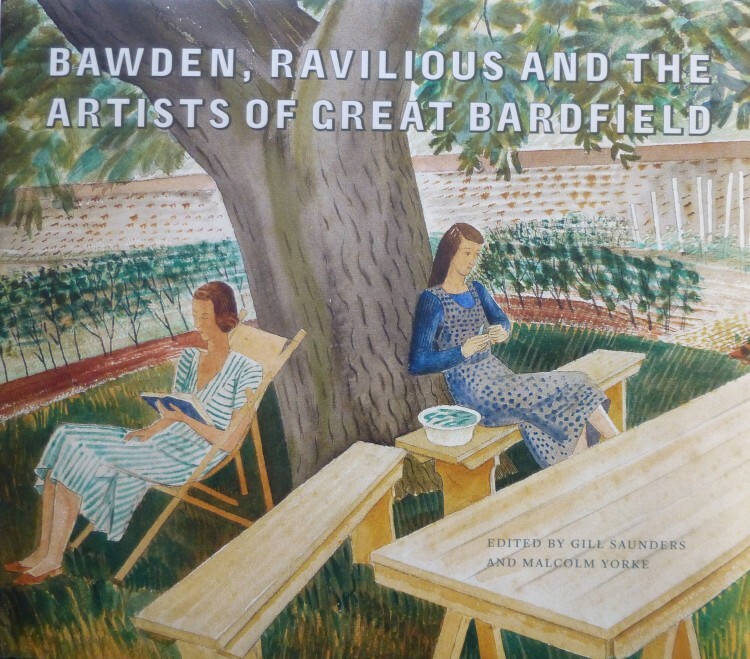 . . . .
and ‘Bawden, Ravilious and the artists of Great Bardfield’ edited by Gill Saunders and Malcolm Yorke . . . .
– which, of course, brings us back to Essex, as Great Bardfield was the Essex village, not far from where I live, that became home to this group of fascinating artists during the early 1930s. It was a really interesting and enjoyable week – but today it was also nice to get back in my studio and make a start on ‘From my October Garden’! In the middle of my week in East Sussex, I spent a day following up Vanessa Bell’s story – Virginia Woolf’s older sister, an artist, took a lease on Charleston Farmhouse, near Firle, in 1916, and moved in with her two sons, Julian and Quentin, fellow artist Duncan Grant and his friend, the writer, David Garnett. The latter two were conscientious objectors, and life at Charleston allowed them work on the farm as was required of them. Charleston became Vanessa’s country home for the rest of her life, and she and Duncan decorated the rooms, the furniture and the garden in their own characteristic way. 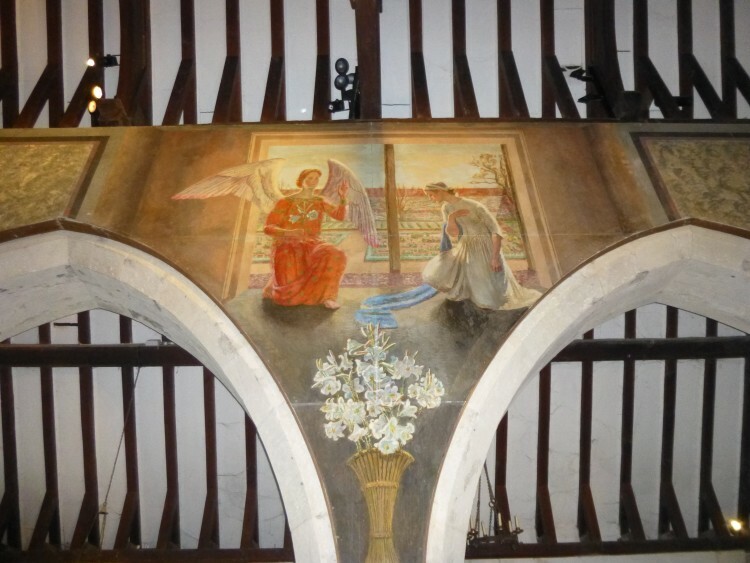 As Charleston does not open until 1.00pm, I went first to Berwick Church, where Vanessa, Duncan, and Vanessa’s younger son, Quentin, painted a series of murals which were mounted onto the walls, depicting the Annunciation, The Nativity, The Crucifixion, and Christ in Glory. 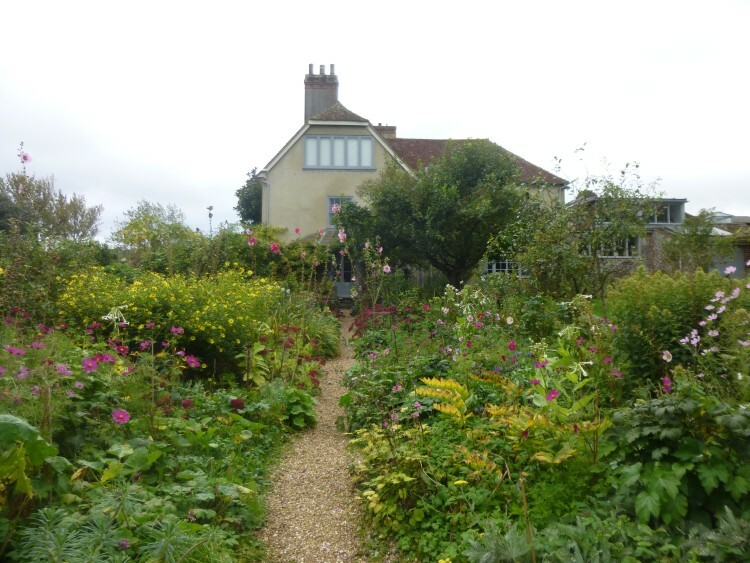 What is magical about them is that they used each other, and other family members and neighbours as models for the people, and set each scene firmly in this area of Sussex. The Nativity takes place in a Sussex barn at Tilton, and through the open doorway is a view of Mount Caburn. 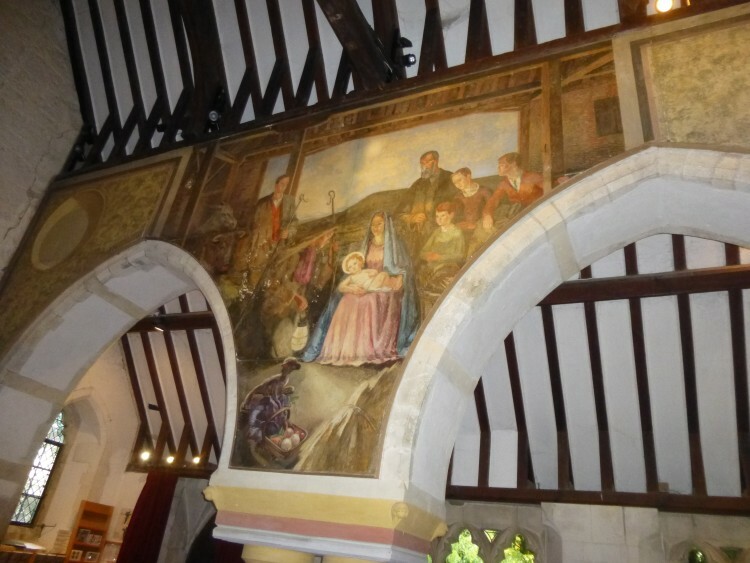 Angelica Bell, Vanessa and Duncan’s daughter, modelled for the Virgin Mary, and in Christ in Glory, the largest mural, a portrait of Bishop Bell (who commission the works), and the then Rector of Berwick, can be seen on the right hand side. The Annunciation – Angelica Bell posed for the Virgin Mary, and her friend, Chattie Salaman, for the angel Gabriel. 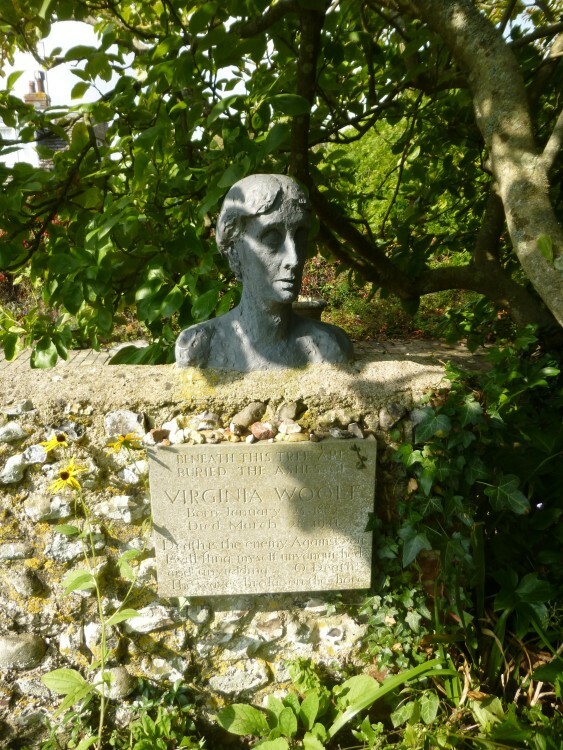 From Berwick, I went west to Firle Church, and found the graves of Vanessa and Duncan side by side in the church yard there, with Quentin Bell’s grave only a few yards away. 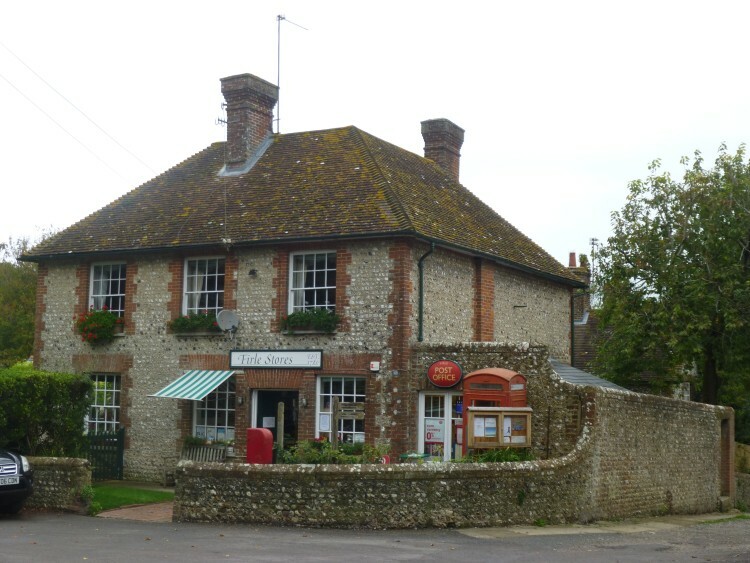 Firle itself is a very picturesque village, and I was particularly taken with the Village Stores, established in 1780! 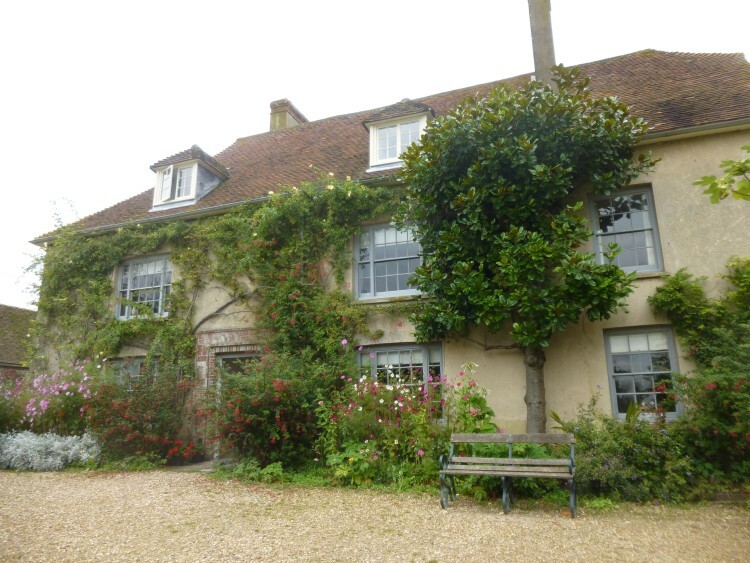 Then it was time for my visit to Charleston Farmhouse itself. Entry is by guided tour, and my group’s guide, Meg, was a real star – a great enthusiast for her subject. It was lovely to see the wall and furniture decorations in reality that I have only seen before in photos. I especially liked the black paint with silver squares and gold arrows in the dining room, and the ‘paisley’ white on pale grey with white flowers in the ‘Garden Room’, or sitting room. The house has a lovely atmosphere, although Meg explained that it was the early years at Charleston which were the really happy ones, and that after Julian Bell, Vanessa’s older son, was killed in the Spanish Civil War, and then her sister, Virginia Woolf, committed suicide, there was a kind of gloom cast over the house. 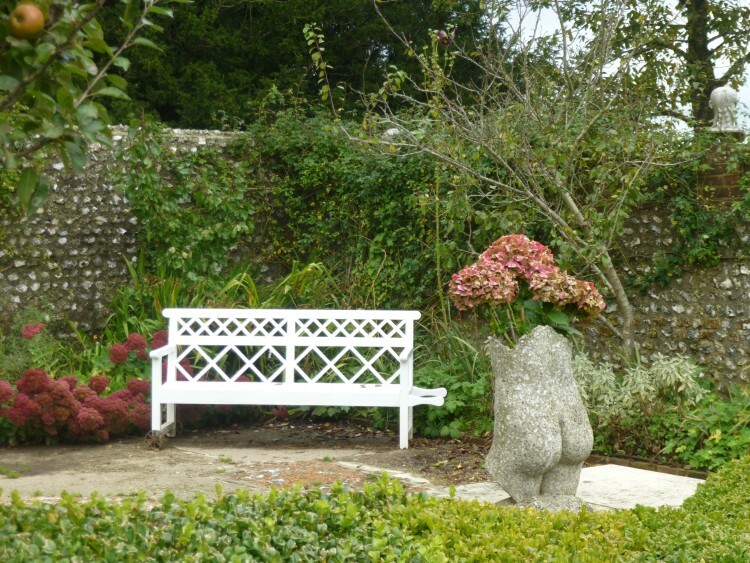 The garden is lovely, too, with a number of curious pieces of sculpture! Part of the garden at Charleston . . . .
. . . . and one of the sculptures. The Studio, which is the last room that one sees, was an extension built onto the original house, and is a fascinating and very up-beat end to the tour, which I really enjoyed. From Rodmell village it is quite a short – though very steep!- walk up onto the South Down, and the bridle path joins at a sort of T-junction with the South Downs Way. 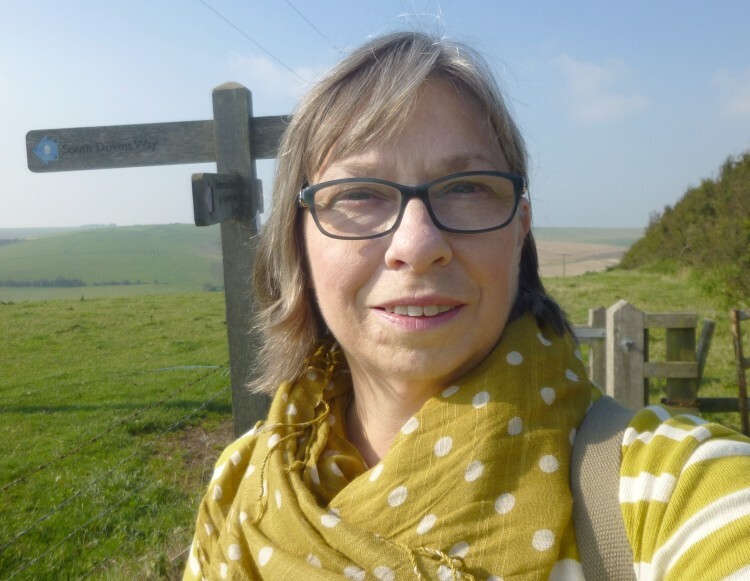 Here I am on the South Downs Way – note the sign behind me! A slightly misty early morning cleared to beautiful sunshine, and I walked, and drew and took lots of photos. Later that day I did a circular walk that takes in part of the South Downs Way – down through Rodmell Village, out across the water meadows until I reached the river Ouse, then right – South – along the bank of the Ouse until I reached Southease, where I stopped to look at and draw the church with its unusual Saxon round tower, and then across a field path back to the main Lewes-Newhaven road near the Rodmell crossroads. The young woman in the shop at Monks House told me about this walk, and I really enjoyed it. It takes about one and a quarter hours.
. . . and my very quick drawing of it! 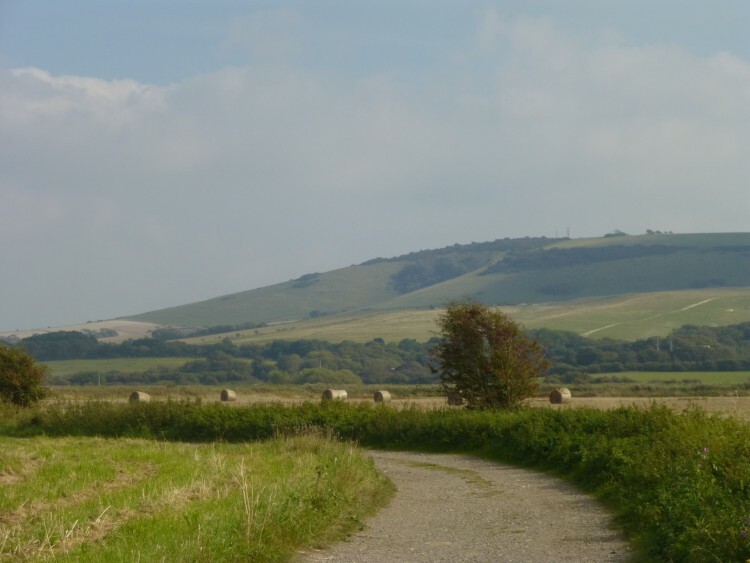 The South Downs Way begins (or ends??) 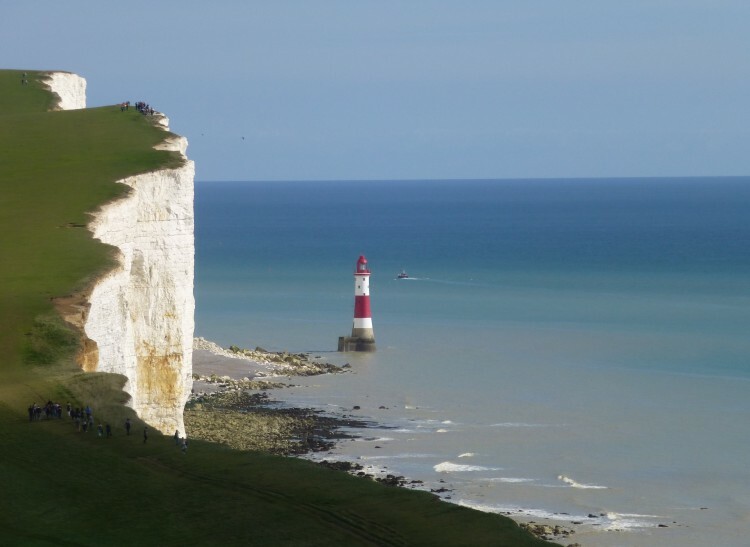 just to the west of Eastbourne, with the cliffs of Beachy Head and the Seven Sisters down to Birling Gap. Later in the week I did two walks here on two separate days. 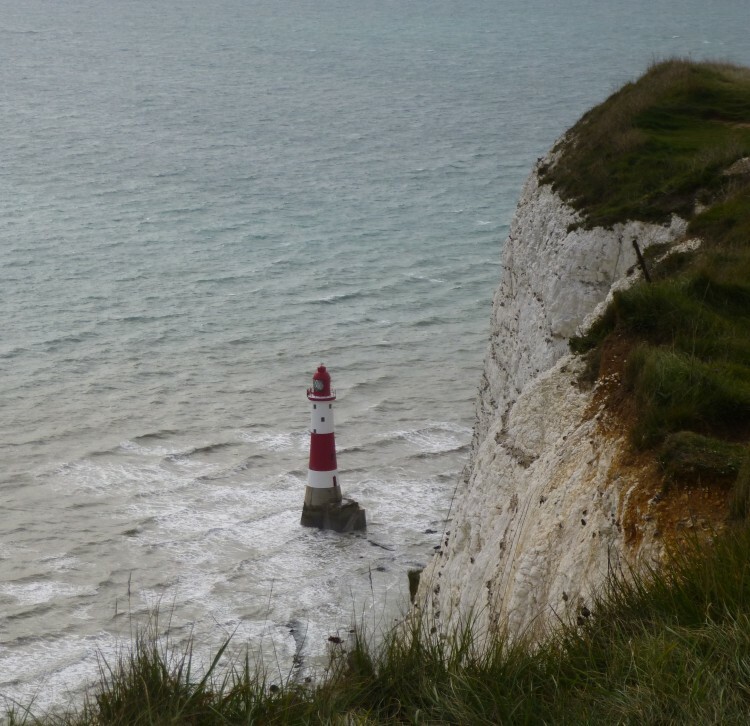 Firstly, I walked up to Beachy Head from the Eastbourne side, almost as far as the Belle Tout (disused) lighthouse. Very scary cliffs, and it was AMAZINGLY windy – I really could not stand up at one point, but had to crouch down to stop myself being blown over!!! But I did get a few photos of the iconic striped lighthouse. 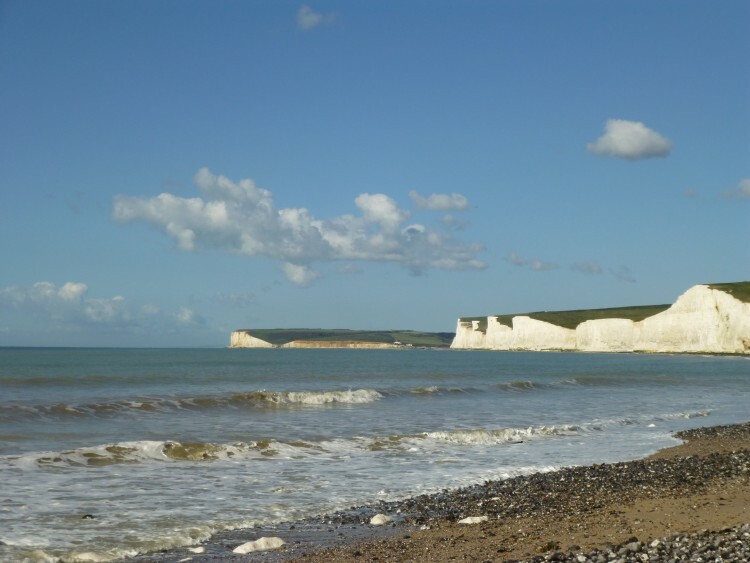 The following day I started off at Birling Gap, where there is a useful National Trust café, and visitors centre, and steps on a sort of scaffold tower arrangement down the cliff to the beach. 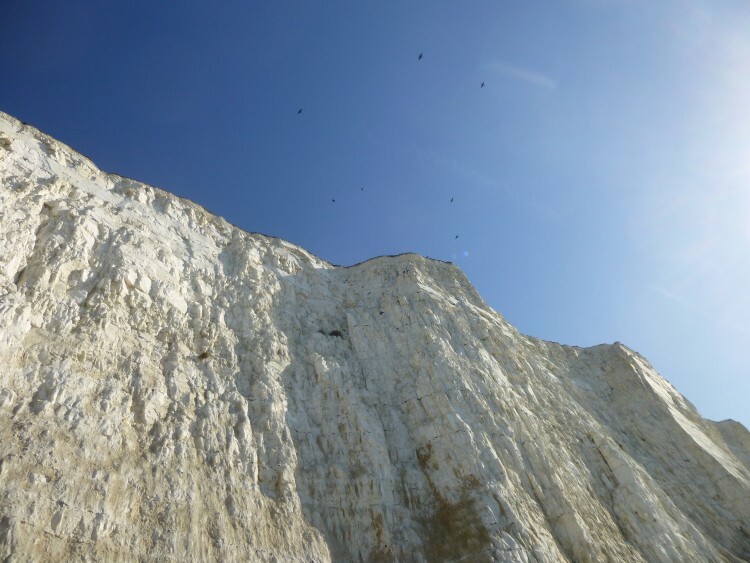 I loved the beach here, lots of interesting stones, and the sheer face of the first of the Seven Sisters rearing up behind, and a wonderful quality of light. The first of the Seven Sisters – or the last, maybe? Then, after some lunch at the NT café – see above! 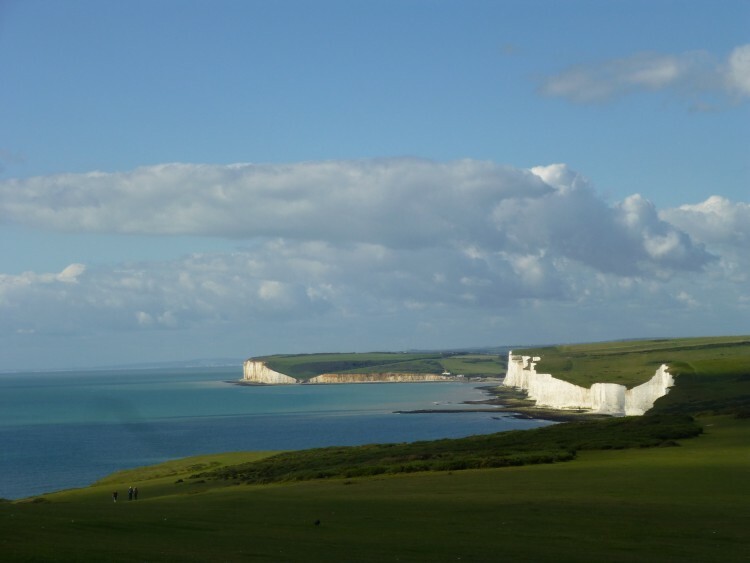 – I walked to Beachy Head from the other direction, stopping to draw the view of the Seven Sisters as I went. 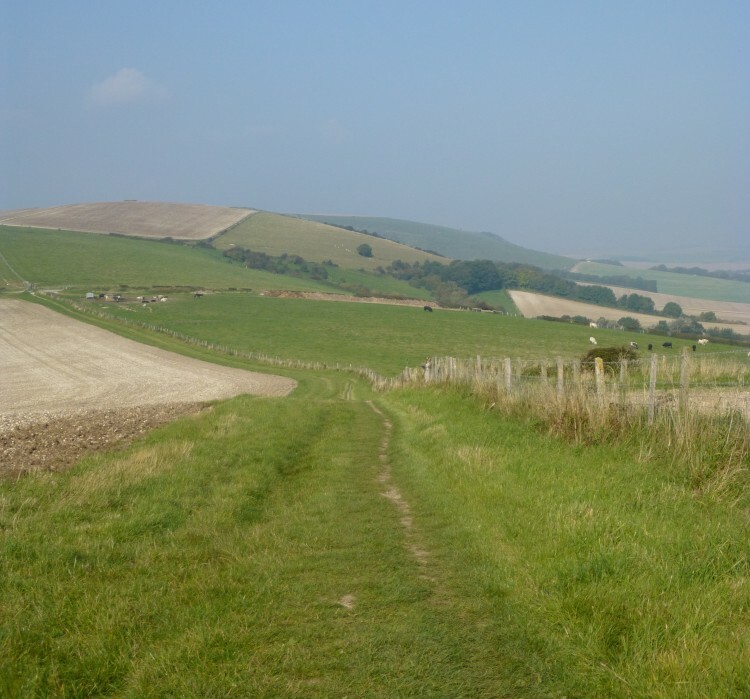 I walked on, up past Belle Tout, and down towards Beachy Head from the other side. Look carefully and you can see people worryingly close to the top edge of the cliff! 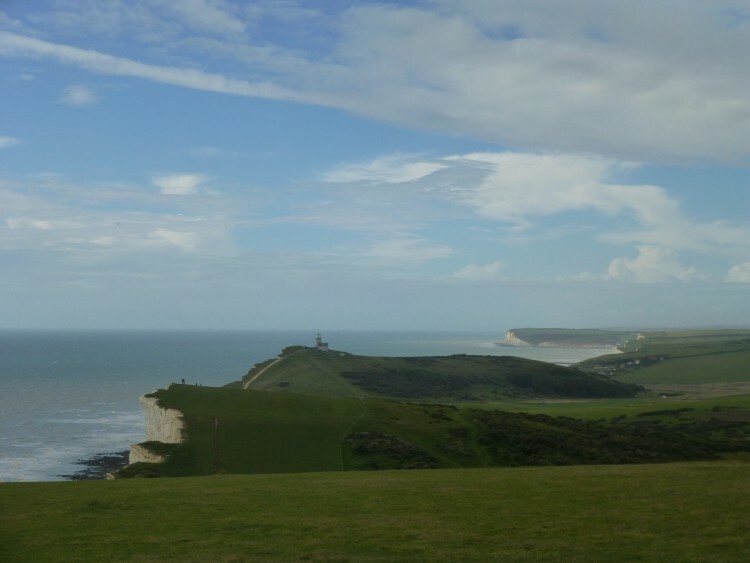 There were lovely views all the way back down to Birling Gap. And by the time I got back I was more than ready to go back into the café for a cup of tea and a sit down! 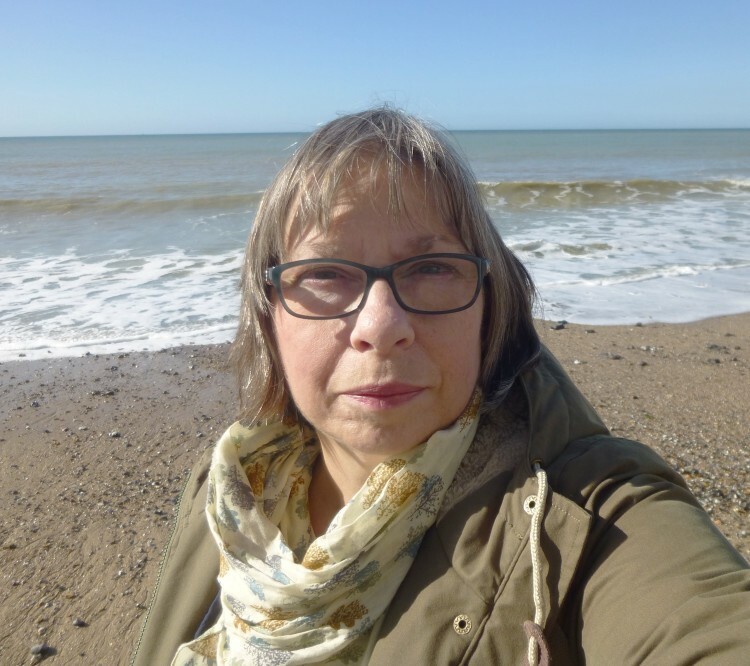 So, I’ve been away for a week staying in Rodmell in East Sussex, walking on the South Downs, drawing and taking heaps of photos, and visiting ‘Bloomsbury’ places. I just got back yesterday. Since I first read ‘To the Lighthouse’ when I was at college ( about 40 years ago . . . .!) I have admired Virginia Woolf’s writing – her diaries and letters as well as her novels. 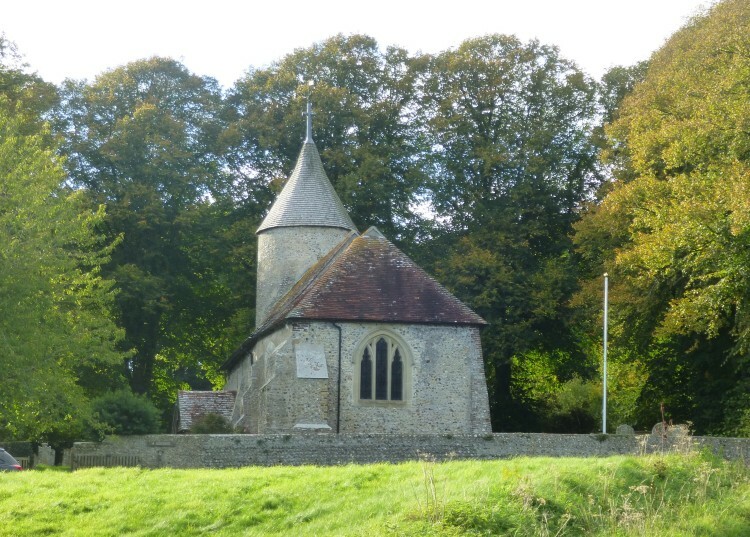 Virginia and her husband, Leonard Woolf, bought Monks House in the village of Rodmell as a country home where they could spend time away from their London home, a couple of months in the summer, and a few weeks at Easter and Christmas, and odd weekends. Virginia was 37 when they bought it, had published ‘The Voyage Out’, and was working on the proofs of her second novel ‘Night and Day’. Monks House played an important role in her writing, giving her quiet and freedom from constant social pressures – although she often complained that they still had too many visitors! 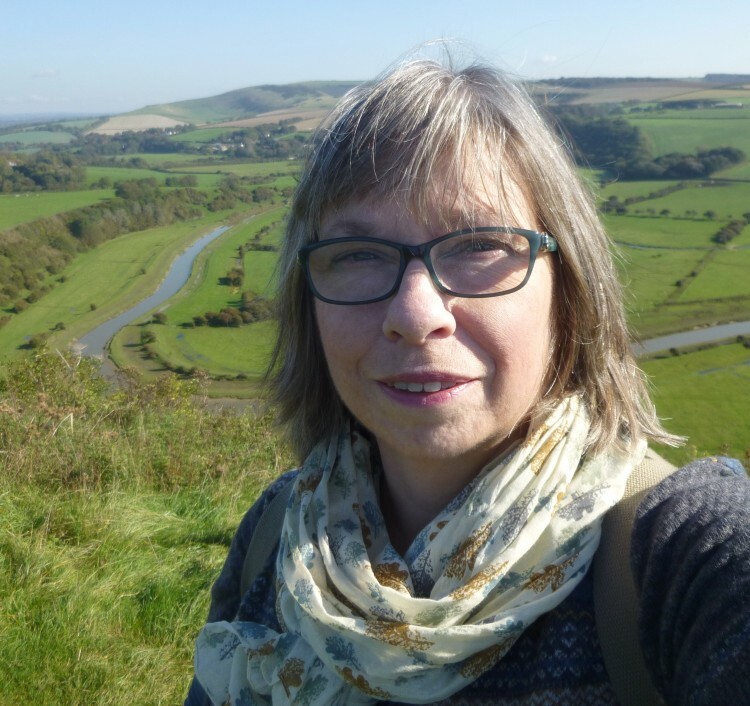 She loved to walk on the downs, and on the water meadows of the Ouse valley, ‘making up’, and talking out loud the next part that she would write, to get the rhythm she wanted into her writing. 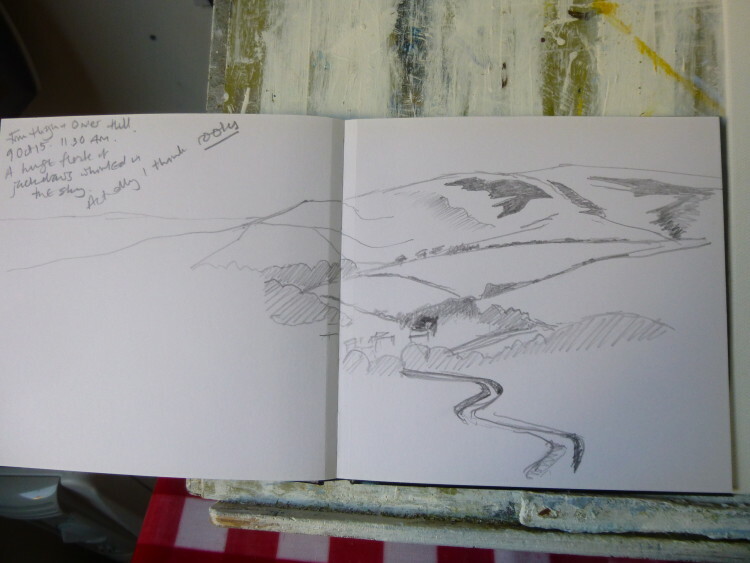 And so I decided to go to stay in Rodmell, just a short walk from Monks House, in a small cosy cottage with a lovely view of Mount Caburn, and combine walking some bits of the South Downs Way and doing some drawing for paintings, with visiting some ‘Virginia Woolf’ places. I’m not quite sure why I’ve never done this before! 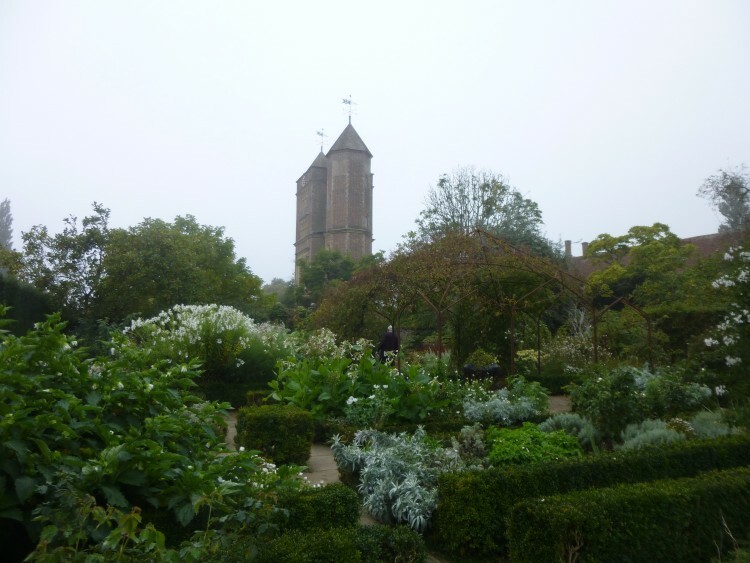 On the way down to Rodmell I stopped at Sissinghurst Castle, the former home of Virginia’s friend, Vita Sackville West, also an author. ‘All Passion Spent’ is my favourite of her novels, but her long poems, ‘The Land’ and ‘The Garden’ are well worth a read, although it’s hard to track down copies these days. The justly-famous garden that Vita and her husband Harold Nicolson made was looking really beautiful, even at this quite late time of the year. I climbed the tower, of course, and the view from the top was definitely worth it, but I also liked the use of some of the otherwise empty rooms on the way up: in one of them, Vita’s poem ‘Sissinghurst’ was written around the walls, accompanied by a recording of Vita herself reading it – the recording started to play as you entered the room. 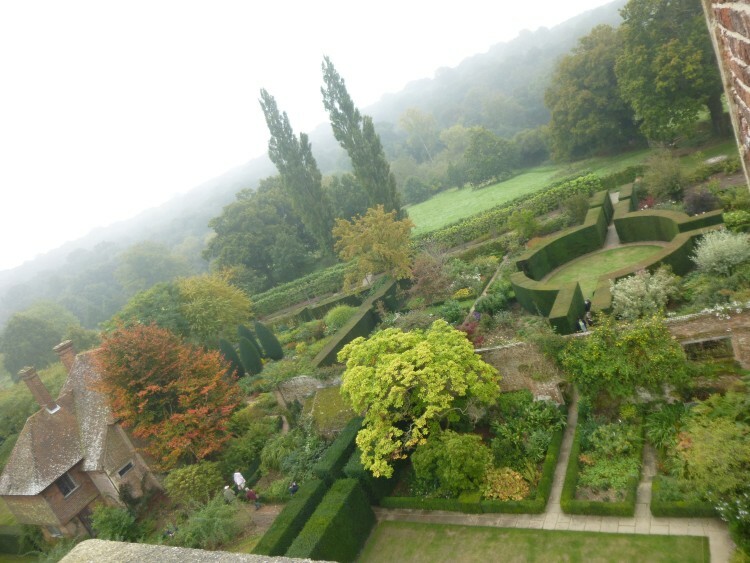 After the grandeur of Sissinghurst, visiting Monks House, the following day, couldn’t have been more of a contrast! 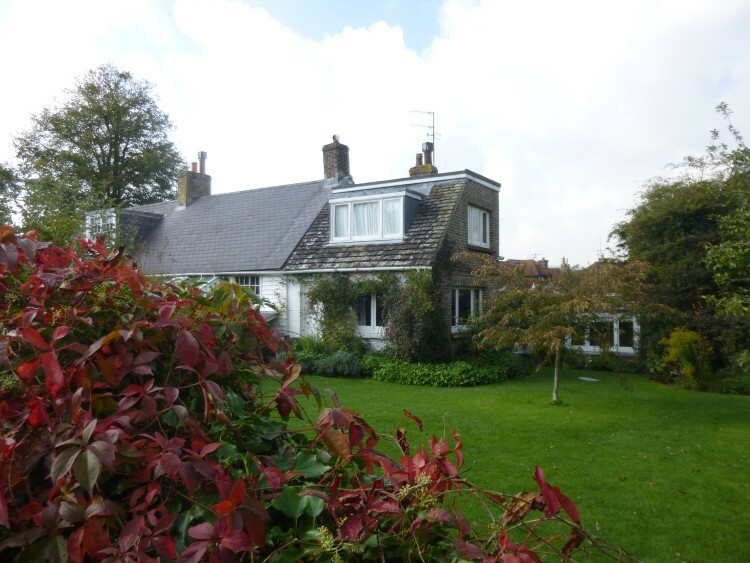 It is a long, low 17th century cottage, with weatherboarding along the front, and when the Woolfs first moved here it was pretty primitive and uncomfortable. But there was a huge garden which they both loved, and in which Virginia’s writing lodge was built, where she could write in peace when the weather was warm enough. 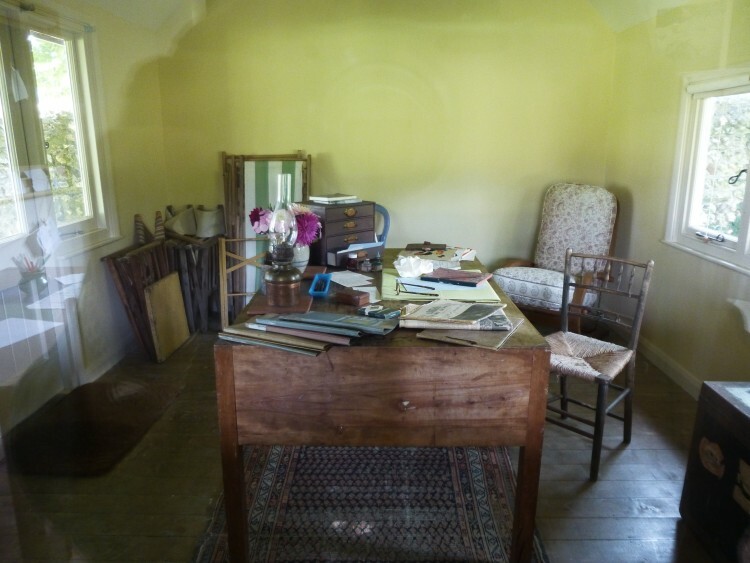 The first room that you enter is ‘our large combined drawing eating room, with its 5 windows, its beams down the middle, and flowers & leaves nodding in all round us.’ Virginia writes in her diary about the partition being taken down to change two small rooms into this big one, and about she, herself, painting the walls green. It was amazing to think of some of the visitors who have sat over the fire in this room talking – T. S. Eliot, E. M.Forster, Lytton Strachey, John Maynard Keynes, Roger Fry – and most visitors complained bitterly about the cold and the lack of comfort! But gradually over the years, as her novels became increasingly successful, they were able to make improvements, and build an extension. She writes in her diary that the world gave her the new extension for having written her novels, which is rather a lovely way of looking at it! The writing lodge is right at the top of the garden, through the orchard, where apple, quince and medlar trees were heavy with fruit. 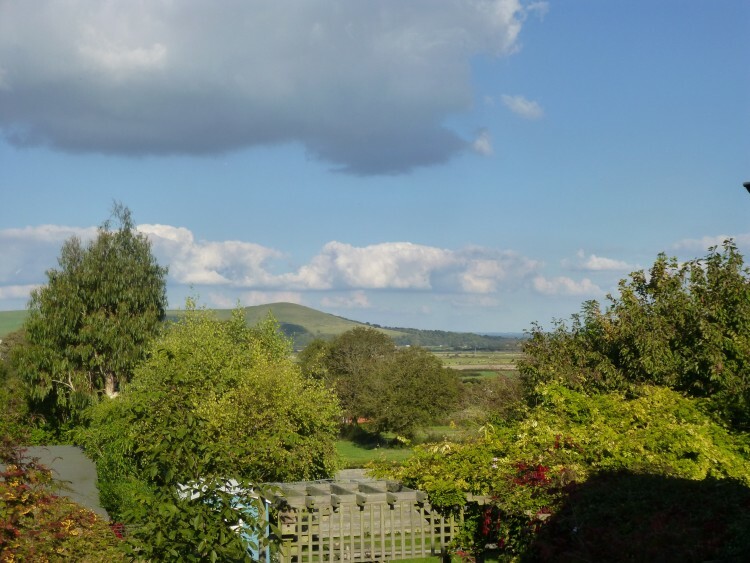 It has a view across the Ouse Valley to Mount Caburn. Outside it is the large lawn where the Woolfs used to play bowls with their visitors – Virginia was a particularly energetic and competitive player, apparently! The box of wooden bowls is still by the back door . . . .
Two exhibitions, either current or coming up, which you might be interested to visit. The Geedon Gallery’s Autumn Exhibition opens on 10th October, and is open daily from 11.00am – 5.30pm until the 25th October, and after that by appointment until 13th December. This year, in a break with tradition, the Autumn show is entirely by members of the Royal Society of British Artists, except for the makers of some of the ceramics, sculpture, glass and jewellery. This promises to be a real treat, and I am looking forward to going. For all the details, look on the gallery website, www.geedongallery.co.uk. One of the exhibitors, Suffolk potter Rob Wheeler, will also be showing at our Lexden Arts Festival in 2016. Usually I have some paintings in the Geedon’s Autumn Exhibition, but not this year! – I’ll be showing in the Spring 2016 exhibition instead. 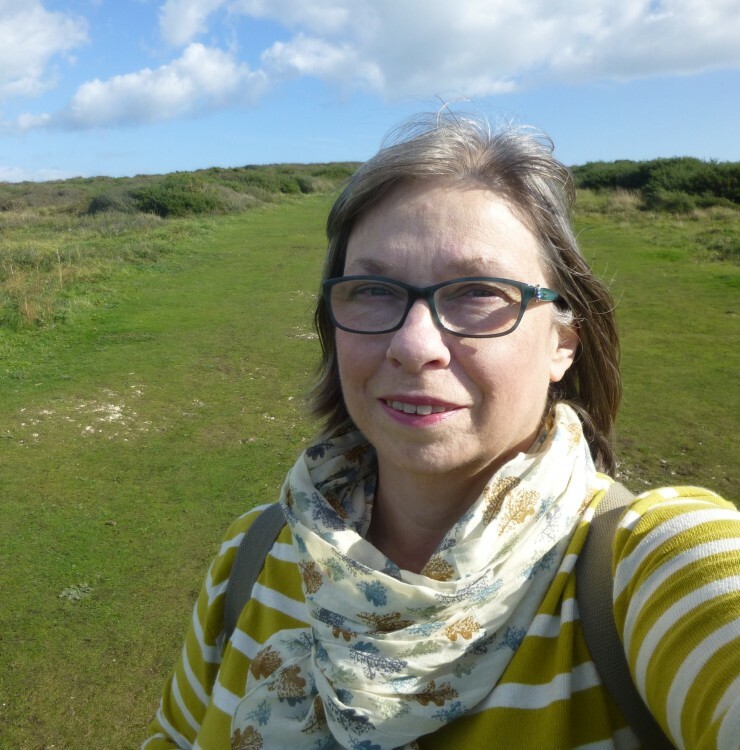 Well, here we are in October, one of my favourite months, and I have a really busy and exciting week coming up – I’ll share all about it in due course . . . .